3. The first migraine attack or headache I remember was: 14? 26. If I could go back to the early days of my diagnosis, I would tell myself: Stop drinking so much caffeine! 30. 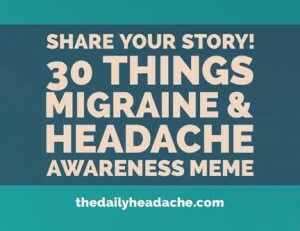 One more thing I’d like to say about migraine or my headache disorder is: It’s not just a headache!